Second painting, of a mini series focused upon Carcassonne. A landscape painting measuring a generous 76 x 121 cms (30″ x 48″), oils on canvas, available, £4,500. 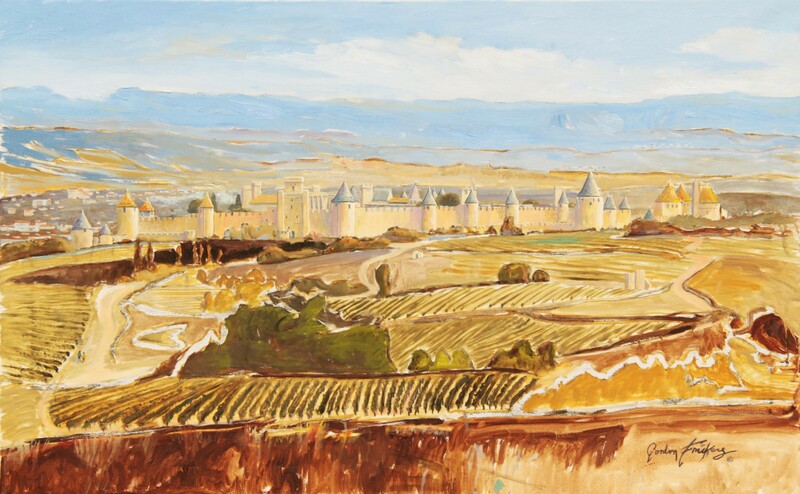 ex studio, ex frame..
A legendary fairy tale city, a painting worthy of adding to your collection, distinctive Carcassone and its landscape of vines, The Black Mountains, in the heart of Cathar country. Carcassonne is set in a wide valley checkered with vineyards in the history rich south west France. The Black Mountains, a National Park well worth exploring, here form an ever changing background, why black? The Black Mountains represent real and wild old France, a voyage of discovery and surprises awaiting us and discover if you will, why they are named the Black Mountains. Not to be missed, this UNESCO World Heritage city is without doubt the most famous, most fabulous monument between Monte Carlo and Bordeaux, visited by a long list of distinguished personalities as varied as Walt Disney, Mik Jagger, Winston Churchill and Mark Twain.